A Beautiful Day Dawned for a concert on Saturday the 8th of April. 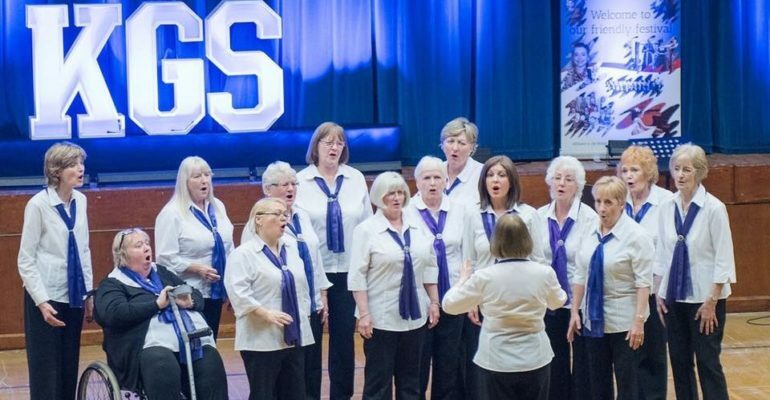 The ladies of Blackpool Soundwaves would be joining 10 other groups and choirs for their annual Lytham festival event. The sun shone brightly and we all appreciated the beauty of the surrounding grounds of Kirkham Grammar school, where the event took place. There were lots of groups of choirs in each of the classrooms. We had a chaperone who brought us to the main hall. We practiced and warmed our voices up. We had front row seats, and it was a real delight to be able to watch all of the performances. We were last on the stage to do our two songs . Our old friends The Blackpool Male Voice choir were there and also The Capricorn Singers. There were many other new and old singers, groups and styles of singing. As we were introduced the atmosphere was electric. The first song we sang was “And So It Goes” by Billy Joel and our second song was “One Fine Day” by Goffin & King. There was thunderous applause and all the ladies were so pleased that our musicality was well received. Its was a day that will go down in Soundwaves History as a proud moment for us all.